Looking for massive bass?. Kicker's CXA1200.1 mono amp can send up to 1,200 watts RMS to your subwoofer. An optional wired remote lets you conveniently adjust the bass level from your front seat. Kicker CX Series CXA1200.1. Trending at $249.80eBay determines this price through a machine learned model of the product's sale prices within the last 90 days. Kicker 46CXA4001 Car Audio Class D Amp Mono 800W Peak Sub Amplifier CXA400.1 New Kicker 46CXA4001 Car Audio Class D Amp Mono 800W Peak Sub Amplifier CXA400.1 New. Kicker EQ Boost: Variable to 12dB, centered @ 40Hz. Kicker CX Series CXA1800.1. Kicker factory refurbished product gives you an opportunity to buy amazing Kicker product at the lowest prices possible. Kicker takes this product through the refurbishing process: first they test every product to find out what's wrong, once diagnosed a Kicker tech at Kicker will fix the product, then run it through a series of rigorous tests to ensure all problems have been fixed and send the products to us for resale. Kicker CX Series CXA300.1. Class-D 2-Ohm Stable Monoblock Amplifier. 3-way protection circuitry (thermal, overload, and speaker short protection). Mono channel operation. Variable Bass Boost: 0 to 12 dB bass boost at 40 Hz. Trending at $119.46eBay determines this price through a machine learned model of the product's sale prices within the last 90 days. Condition is Used. In fully functional condition with bass knob and cable. Kicker CX Series CXA1200.1. Get clear, powerful sounds in your vehicle with the Kicker 1200 W Mono Amplifier. Class-D 2-Ohm Stable Monoblock Amplifier. 3-way protection circuitry (thermal, overload, and speaker short protection). Trending at $233.25eBay determines this price through a machine learned model of the product's sale prices within the last 90 days. These fees are non-negotiable. Descri ptions. FOR MORE INFORMATION ABOUT STORE, READ FULL DESCRIPTION. Kicker CX1200.1 1200W Mono D Audio Amplifier. Condition is Used. Shipped with USPS Priority Mail. Efficient Class-D amplifier. This CX-Series Mono Amp is now one-ohm stable, giving you even more power and wiring options for your system! A powerful 12dB crossover and 24dB subsonic filter is included, letting you quickly tune your system to perfection. DXA500.1 (43DXA500.1) D-Series Mono Amplifier. DXA500.1, 43DXA500.1, 43DXA5001, 43 DXA5001, 43 DXA500.1. If you do not see the official KICKER Authorized Dealer seal, then it is not an Authorized Dealer. Shows scuffs do to mounting for display but has been tested and is in great working condition. Looking for strong bass?. Kicker's CXA600.1 mono amp can send up to 600 watts RMS to your subwoofer. An optional wired remote lets you conveniently adjust the bass level from your front seat. SEE REAL IMAGES. BELOW IS SPECS AND ITEM CONTENTS. OEM BIRTH SHEET NEW NOT USED CONDITION 10-10. OEM BASS KNOB WIRE OPENED FOR IMAGES CONDITION 9-10. Kicker CXA300.1 (43CXA300.1) Open Box. 600W Peak (300W RMS) CX Series Monoblock Class D Subwoofer Car Amplifier. Class-D 2-Ohm Stable Monoblock Amplifier. Kicker CX Series CXA300.1. 3-way protection circuitry (thermal, overload, and speaker short protection). kicker 1500.1 amplifier. Condition is Used. Shipped with USPS Priority Mail. KICKER 41DXA1500.1 D-Series Class D Monoblock Car Audio Amplifier. D-Series Monoblock Class D Car Amplifier. Advanced circuitry for superior power, clarity and dependability. Allows users to dial in the perfect sound. 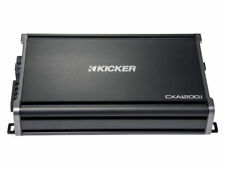 Kicker KXA800.1 (44KXA8001) Open Box (Complete). 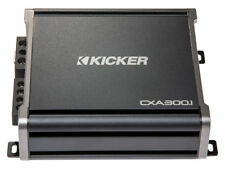 Kicker KXA800.1. Also found as: KXA 800.1, KXA8001, KXA800 1, Kicker monoblock amp. Amplifier Series KXA. Class-D 1-Ohm Stable Monoblock Amplifier. 6 phase alternators use less horsepower per Kilowatt than conventional 3 phase alternators. (1) - KICKER ZX1000.1 MONO CLASS D 1000W RMS RATED @ 2 OHMS STABLE AMP. Kicker ZX1000.1 ZX Series 1000 Watt Class D Monoblock Car Audio Amplifier. Balanced differential inputs make KICKER ZX Amplifiers compatible with any factory radios. 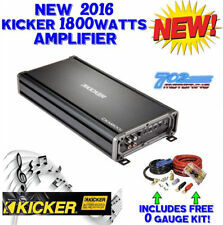 All KICKER Refurbished Amplifiers now feature FIT?., or Fail-Safe Integration Technology. FIT utilizes isolated differential inputs, rejecting noise and electrical interference for the quietest operation possible and ultimate audio clarity. I purchased this and never installed it. Still unused new in box. Box shows some wear, but my loss is your gain. MODEL [at 14.4V] :MONO AND MULTI-CHANNEL CX-SERIES MONOBLOCK AMPLIFIERS CXA1200.1. • Kicker CX Series CXA12001.1. CX1200.1 Mono Amplifier. See below for more details. • Class-D 2-Ohm Stable Monoblock Amplifier. Built-in crossovers and adjustable KickEQ™. signature KICKER compact footprint. Featuring an optimized circuit layout for the most efficient use of components and clearest sound quality for trusted reliability in the most compact chassis allowable. Kicker Zx 1000.1 Amp Amplifier. this amp is an absolute beast! Unfortunately these are hard to come by now that they are discontinued. This includes the remote gain adjustment knob that you can mount under the dash etc Good Used Working Condition . Shipped with USPS First Class Package (2 to 3 business days). Kicker 12CX1200.1 Mono Subwoofer Amplifier . Condition is Used. Shipped with USPS Priority Mail. 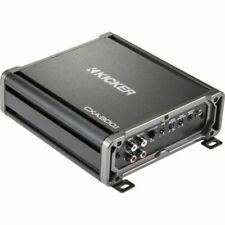 KICKER CXA300.1 300W RMS Mono Class D Amplifier (43CXA3001). Condition is Used. Perfect working condition. Shipped with USPS Priority Mail. Kicker Mono subwoofer amplifier — 250 watts RMS x 1 at 2 ohms. mono subwoofer amplifier. Amplifier 4 Gauge Kit. Wate Resistant Inline Fuse Holder AGU Type 4 Gauge. AGU Fuse 80 AMP Gold Plated. 17Ft Blue Power Wire 4 GAUGE. Kicker CX Series CXA600.1. Kicker factory refurbished product gives you an opportunity to buy amazing Kicker product at the lowest prices possible. Kicker takes this product through the refurbishing process: first they test every product to find out what's wrong, once diagnosed a Kicker tech at Kicker will fix the product, then run it through a series of rigorous tests to ensure all problems have been fixed and send the products to us for resale. 200 watts RMS x 1 at 0.5 ohms. 100 watts RMS x 1 at 1 ohms. Bass Blockers. - Factory Radio. - Motorcycle Speakers. - Installation Harness. - Cooling Fans. - OEM Harness. - In Ceiling Speakers. - Bass Guitars. Kicker Car Stereo Amplifier CXA300.1 300 Watt RMS Mono Class D Gently USED!!! Amp used but working excellent, its been tested before posting. First picture is a stock image the rest are actual. No Original box included. Listing for AMP only. 5 out of 5 stars - Kicker Car Stereo Amplifier CXA300.1 300 Watt RMS Mono Class D Gently USED!!! 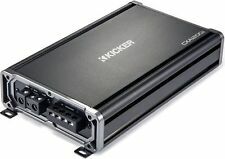 1 product rating1 product ratings - Kicker Car Stereo Amplifier CXA300.1 300 Watt RMS Mono Class D Gently USED!!! This is a NEW Kicker CX300.1 Mono-Channel Amplifier perfect for powering a single subwoofer! - output of 300W RMS @ 2Ω and 150W RMS @ 4Ω. - Electronic Crossover: Variable Lo-pass 50Hz–200Hz, 12dB/octave. Kicker 46CXA18001 Car Audio Class D Amp Mono 3600W Peak Sub Amplifier CXA1800.1 Kicker 46CXA18001 Car Audio Class D Amp Mono 3600W Peak Sub Amplifier CXA1800.1. Kicker EQ Boost: Variable to 12dB, centered @ 40Hz. A Kicker amp mono can boost your audio system. You can choose from a wide selection of amplifiers on eBay. Here are a few things to consider before you purchase an amplifier from Kicker. An amplifier is designed to take a weak signal and amplify it. Some stereo systems may sound low or weak. Standard speakers can cause the distortion levels to rise when music is played at higher volumes. This distortion is due to the lack of power. An amplifier can help to eliminate the loss of power. Separate speaker channels allow you to power each speaker without losing any sound to the components. What components are powered by the amplifier? An amplifier is used to power a variety of components in your car's sound system. The subwoofer and speakers are powered by an amplifier. If you are looking to get high-quality sound from your speakers, you need to have them set to their own channels. Some people even choose to connect the subwoofer to a separate channel. Tweeters can be connected to an amplifier. Kicker has a wide selection of products in its accessible amplifier line. The products are versatile enough that you can stick with a single series or mix them up for a more customized sound. How many channels are needed for an amplifier? Amplifiers are available with multiple channels or with a single channel. A mono amplifier is also referred to as a monoblock. Mono amplifiers only have one input and output. You can tell the difference between the amplifiers by looking at the labels. Amplifiers with dedicated left and right labels are multichannel amps. These amplifiers come in two-channel, three-channel, four-channel, five-channel, and six-channel models. The number of channels will depend on your equipment. If you are looking to maximize your power, each component needs a separate channel. Subwoofers and tweeters often share the same channel. Kicker amp mono components can be connected together for even more power. There are many ways that you can connect your system for good sound quality and for the amount of money you’re willing to invest in your system, and you can find your affordable system on eBay. Where can an amplifier be installed? Content provided for informational purposes only. eBay is not affiliated with or endorsed by Kicker.